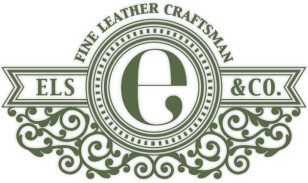 At Els & Co. we believe that merely holding an exceptionally made product and smelling the sweet polish on the leather can satisfy the soul. The strong cotton canvas are double secured between two layers of top grain, veg tanned leather to ensure that it will last for a lifetime. Each item is painstakingly hand stitched using thick coated cotton thread. This art form takes several years to master and the result is one that only the honest tactility of true craftsmanship can achieve, and a prroduct that will last a lifetime. As each product is crafted upon order, we can laser engrave your name or family crest onto the leather for that personal touch.